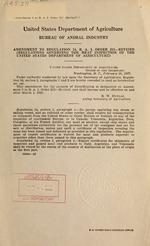 "Amendment 5 to B.A.I. Order 211, Revised." "Shall become and be effective on and after March 1, 1927." Washington, D. C., February 28, 1927.
countries other than those named in this paragraph.